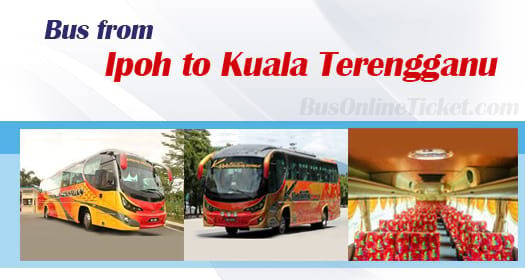 Bus from Ipoh to Terengganu is one of the important service to connect people from Northern region to East Coast Region. Many local residents rely on this express bus service from Ipoh to Terengganu because there is no direct train and flight service available between Ipoh and Kuala Terengganu. Kesatuan Express is the only bus operator offering bus service from Ipoh to Kuala Terengganu. Kesatuan Express is a famous bus operator with headquarter in Ipoh. Kesatuan Express has strong presence and extensive bus route covering Northern and Eastern coastal of Peninsular Malaysia. Kesatuan Express offers 1 daily trip from Ipoh to Kuala Terengganu. The bus will leave the bus terminal at night 8:30am. The duration required from Ipoh to Kuala Terengganu by bus is about 8.5 hours depending on the road traffic and weather condition on the travelling day. As it is a long journey, washroom break will be given along the highway. Extra break will be given upon request from the bus driver during the journey. The bus fare from Ipoh to Kuala Terengganu costs about RM 62.50 for adult and RM 50.00 for child. The bus from Ipoh to Kuala Terengganu will pick up passengers at Aman Jaya Bus Terminal. Residents in Ipoh town area could take about 30 minutes public bus or taxi from Ipoh town area to Aman Jaya Bus Terminal. Upon arriving in Kuala Terengganu, the bus service will terminate at Kuala Terengganu Bus Terminal. With limited bus schedule available from Ipoh to Kuala Terengganu, passengers are advised to book their bus ticket online in advance to avoid any disappointment. With the convenient and user friendly online booking platform BusOnlineTicket.com, you can book your tickets now in anytime, anywhere and any places. You will receive a confirmation email instantly once your payment is done.